Brazil is the fifth largest country in the world. It’s geopolitically divided into 5 regions, subdivided in 26 States and the Federal District. Brazil is the largest country in South America (8.515.759 km²). The regions are: North, Northeast, Center-West, Southeast, South. This division uses criteria, such as: geographic, economic, cultural and social aspects. Most of the Amazon rainforest is located in this region. It’s marked by constant conflicts between landowners and indigenous tribes. Its economy is based on iron, energy production, electronic manufacturing, latex and tourism. Learn Portuguese in Record Time with my method. It’s very hot all year long and its beautiful beaches make the region very appealing to foreign and Brazilian tourists. The region has the lowest levels in many social indicators and it was the first place colonized by the Portuguese in the 16th century. Its economy is based on tourism, cocoa, machinery manufacturing and textiles. The Center-West is the second largest region of Brazil, but in terms of population, it’s the least populated one. The country’s capital, Brasília, is located in this region. Its territory also covers the Complexo do Pantanal, a great venue for ecotourism. The Center-West is the least industrialized region in the country and its economy is based on livestock, soybeans and tourism. The Southeast is the vital center of the country, where the largest cities, the highest population density and the best ports are concentrated. The Southeast population is composed of all kinds of nationalities. This region received immigrants from different parts of the world, mainly from Italy, Japan and Germany. 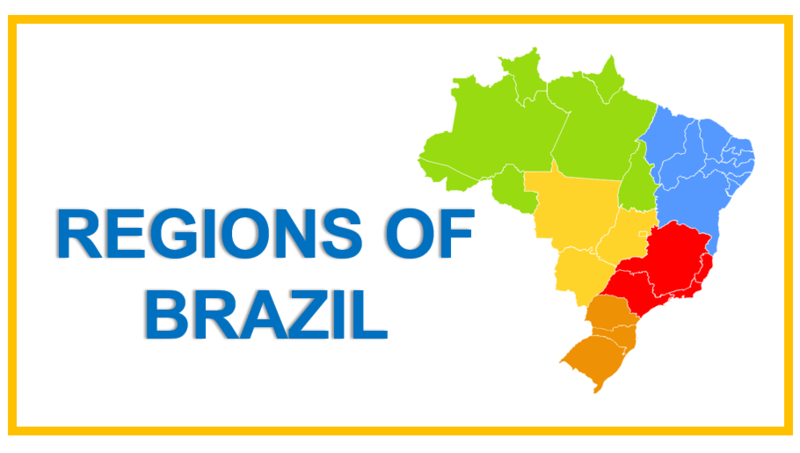 The Southeast region is the major powerhouse of the Brazilian economy. It’s responsible for 53% of the Brazilian GDP. The biggest companies in Brazil have their headquarters in this region. The Southeast economy is based on: manufacturing (machinery, electronics, automobiles and aviation), coffee, sugar cane, tourism, petroleum, textiles and energy production. The South is the smallest region of the Brazilian territory. Along with the state of São Paulo, the region has a strong immigrant presence. The majority of immigrants came from Germany, Italy, Poland, Russia, Ukraine and Japan. Its population presents the highest literacy rates in Brazil, which explains the best social indicators of the country and the high standard of living. However, the South is not immune from poverty, violence and other social issues. Its economy is based on machinery and automobile industries, textiles, tourism, energy production and information technology.